This term I have been learning how to write good blog comments on different blogs.We have been making lots of comments on other schools blog.The difference it has made is I know how important it has been to practise writing before I copy and paste on the blog. I enjoyed posting on different post because they might also comment on my post. It has been challenging to connect with the other people's blog post but I think I have improved. Here is a comment that I have left on a blog.I've been positive and specific. The difference it has made is it's been really really good for us to practise improving our learning. We have enjoyed writing blog comments because it also helps other people to connect and be interested in our blog. The most challenging part for me is remembering how to spell the words correctly. It's important that my comments make sense. My name is Christian Patrick Eliza and I am from Tongatapu Nuku’alofa. I have one sister and one brother and I am the eldest. I turned 12 on 17 April 2012. The only thing that is amazing is that when it was 2011 I turned 11 and now it is 2012 and I am 12 ! So it keeps on going on and on. My mom has her birthday in July and my Dad in November. We live in Glen Innes. My grandpa used to be a commando for the Tongan police. My goal is to be like him one day. He loved being a policeman because he wanted to follow his grandpa's footsteps. My mom and dad were born at the Vaiola Hospital. My favourite colour is blue and I really enjoy Mcdonalds. I am interested in a singer called Michael Jackson because I have been one of his fans since I was little. I really want a Rugby Scholarship when I finish college or University. When I was about 5 my dream was to be a future All Black. I still have that dream. I play for a club called University Rugby Club and that's where some All Blacks started playing when they were little. In my future I would like to see robots as our equals because they can do all the boring everyday jobs. That means I can get on and do the really exciting stuff in life. 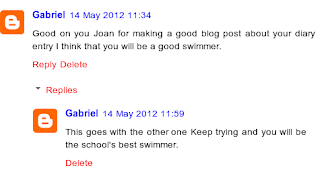 This term we have been learning about three points on blog commenting. The three points are positive which means you tell them something nice about their blog post they made. The second one is helpful. A helpful comment adds more information. The last one is thoughtful, which means can you make a connection with the author. I have really enjoyed learning all three of these points because it doesn't just help the writer but it also helps me with commenting better. Here is a comment I left on someone's blog. I think this is a good comment because I have connected with the author and also been positive about her mouthwatering post. We are at Pac ‘n Save so that we can learn all about the different kind of foods to eat and not to eat. Ansley has been our instructor for the last two weeks. She taught us all about all of the sugar in fizzy drinks and how to read the nutrition guide.Ansley said to my group that we had to look at all the different good and bad snacks that we could not and should not eat. We had to choose two different snacks and then we would have to choose which one is better for us. I was very surprised to see all of the sugar, fat and salt in the snacks we eat daily because I thought there would be only a little because they don’t taste sugary. This was a life changing experience and I know I can eat healthier from now on. This is a chart that shows you all of the energy and sugars so that people can know what they are buying and if you are trying to eat healthy this should be the second thing you check on the box. One some of the muesli bars or other products might have a red tick that is called the heart foundation tick that means that the heart foundation approve of the product and that means that that product is good for you to have everyday. These is a very good example of a very good cereal to have in the morning because it has no fat total. This muesli cereal would be very light. Hi my name is Tame’e. My Family comes from Tonga, but my Dad comes from Vava’u which is town in another part of Tonga. My Mum comes from the Capital of Tonga, Nuku'alofa. My Goals are to study Singing and Drama. My idol is my older sister Eseta. She taught me how to sing when I was just 4 years old. My strongest interest is singing because my family have been singing all their lives. My brother and his band, which won Pacifica Beats, made a song for all reggae lovers called Reggae’s My Heart. So I want to be the next step on the family musical tree. I really want to sing and do drama because I want to follow in my parents footsteps. My mum and Dad were always the soloists in the youth group at our church. Sometimes I sing in church with my family and other young people. We always have a chance to compete with other youth in singing competitions. I really want to get in to University to be a Music Teacher to help kids follow their dreams of singing.